The 5 members of South Korean boy band BIGBANG is back! This time with all members present. Fans may remember their last release was from more than a year ago with their singles, "Tonight", "Hands Up", and their follow-up singles "Love Song" and Stupid Liar". We may also remember the scandals the members have overcome especially Daesung's accident. Now, it will be a one-word title for their lead single of the 5th mini-album, "BLUE", which presents a different look from the members, a little colder, filled with ice, a more chill track. It is already expected that their comeback will dominate the local charts and will extend their popularity more internationally. New BLUE Lyrics from LatestVL. 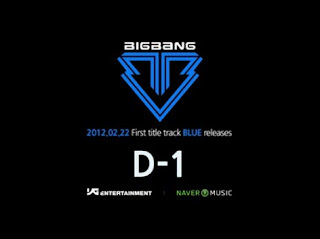 "BLUE" video recorded by Big Bang is located above. As you notice, we don't have the full precise Big Bang - BLUE Lyrics. But if you happen to have some parts or maybe the full lyrics, please put it on the comment below or submit the lyrics directly. You can also suggest songs that are not in this blog yet. yes! big bang is back! so fast ! TY so much for the lyrics!